Bits of fresh watermelon, a flavor punch from watermelon gelatin, and a moist batter make up a fantastic summer cake perfect for porch parties, and picnics. Refreshing bits of watermelon add unexpected crunch. Preheat oven to 350 degrees. Spray a 13 x 9 x 2 baking dish or cake pan with nonstick spray. Working in batches, using a double thickness of paper towels, squeeze the excess juice from the chopped water melon. Place in a bowl and scrape any stragglers off toweling. Set aside until needed. In the bowl of a stand mixer, cream together shortening and sugar until fluffy. Add both egg whites and beat until incorporated. Stir together flour, baking soda, and salt. Measure out 3/4 cup of watermelon, and toss with 3 TB of the flour mixture. Set aside. Alternating between wet and dry, add flour mixture, then add buttermilk until all is incorporated. Measure out 2-1/2 TB of jello and add to mixture. 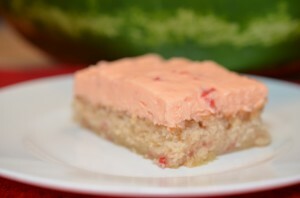 Add watermelon that was tossed with flour. Stir to incorporate. Pour batter into prepared pan. Bake for 30-35 minutes or until cake pulls away from sides of pan and is a rich golden brown. A toothpick inserted in the center should come out with a few crumbs if any attached. Cool completely before frosting. You can speed up the cooling by placing the cake in the freezer for 30 minutes. In the bowl of a stand mixer, beat together butter and cream cheese until smooth and creamy. Add powdered sugar a cup at a time until mixture stiffens to the consistency of stiff whipped cream or cream cheese frosting. Stir in remaining jello and watermelon bits. Check consistency. It should not be too creamy or it will run down sides of the cake. It should not be too stiff or it will tear the tender cake when applied. It should create a soft peak ie the tip will bend over when a spoon is pulled up through it. Once cake is sufficiently cooled. frost the top taking the frosting all the way to the edges. This is a generous amount of frosting. Use as much as what makes you happy. Refrigerate before serving for about 30 minutes. Store leftovers covered in the refrigerator.